Towards the end of the Second World War there began a renewal of interest in the life and work of Toulouse-Lautrec, and it was then that Cornelia Otis Skinner conceived the idea of a full-length solo drama about the various women – mostly entertainers of the bal musettes and the cabarets – so magnificently portrayed in the posters and canvases of the artist. Miss Skinner then began what she has since described as “a complete and enraptured immersion in every obtainable book, record, letter, and artifact of Paris society between 1870 and 1900.” But as the material accumulated, Miss Skinner realized the necessity of broadening the scope of her projected drama. The colorful characters immortalized by Toulouse-Lautrec were an engrossing part of the Parisian scene – but only a part. There were many aspects of the great pageant that demanded inclusion in order to provide a more fully rounded picture of Paris in the 1890s. Two years of preparation, including a visit to France for personal interviews and further research, preceded the writing of the play; planning production details consumed the better part of another year. At last the play was written, and it was given its premiere at the Academy of Music in Northampton, Mass., on January 12, 1952, before an enthusiastic audience. After a successful tour of several months, Paris ’90 came to Broadway to the acclaim of critics and public. As the curtain rises on the opening scene of Paris ’90, listeners are transported to the chestnut-shaded Champs-Elysées. A predominantly female contingent forms the ultra-smart portion of the carriage parade pulling along the great boulevard. Such a member of the “upper crust” is “A Lady of Fashion,” a worldly, candy-box blonde whose major preoccupations are with her luncheons, shopping, social calls, and romantic rendezvous. Now the scene shifts to a niche on the western portal of Nôtre Dame, where the stone figure of “An Angel” looks down upon the moonlit city and muses upon the frailty of humans. A new character appears, a rosy-cheeked young “Laundress.” Very little escapes her good-natured attention as she delivers clothes to her customers. Among these customers are two “Boston Schoolteachers” living in a flat on the quai. One of them appears on a small balcony and observes that the sunny day will be perfect for their proposed visit to the Luxembourg. Both teachers are tired and nervous as a result of their hard study for their Ph.D. degrees. A thoughtless act produces a touching revelation from the weaker of the two. Across the hall from the teachers lives a coquettish blonde. She receives a call from a strange Englishman. He is romantically inclined; she is determined to remain “A Woman of Virtue.” The climax is hilarious and surprising. The second act of Paris ’90 is concerned with friends of Toulouse-Lautrec. One of these is “La Goulue,” a coarse and beautiful blonde with an inordinate appetite for food and drink. Originally a laundress, her uninhibited ability won her a job as a dancer, and in the ’90s she reigned spectacularly at the Moulin Rouge, a place immortalized by Toulouse-Lautrec. Berthe la Sourde, or “Deaf Bertha,” is the subject of one of Toulouse-Lautrec’s finest paintings. Here she companions the painter on a picnic he is giving to celebrate her birthday. Although Yvette Guilbert was booed off the stage when she first appeared as a scrawny cabaret singer in Lyons, she soon became famous in Paris where writers, painters, and musicians flocked to hear her sing. She epitomized much that was good and much that was zestful in the Paris of the ’90s. *************** Cornelia Otis Skinner was indeed born to the theatre. Her father was Otis Skinner, one of the most famous and distinguished actors ever to star on the American stage. Her mother, whose stage name was Maud Durbin, frequently appeared as leading lady in her husband’s Shakespearean productions. After two years at Bryn Mawr, Miss Skinner spent a year in Paris with her mother, and there she took instruction in acting from some of the finest artists of the French theatre. Miss Skinner made her professional debut with her father in the latter’s production of Blood and Sand in New York City. Appearances in other plays failed to satisfy her creative spirit, and she longed for a widening of her horizon. During her college years, Miss Skinner had written and performed monologues, much to the delight of teachers and fellow students. “Why not turn this talent into the channel of finished art?” asked her father. “She could people her stage with her own creations and be a whole company in herself,” continued her father. “The result was a series of sketches, humorous, pathetic, tender, and satirical, which her photographic eye had caught.” These sketches were immediately praised, and with them Miss Skinner toured the United States, Canada, and England. From these sketches grew the memorable series of historical dramas for a single actress, among them The Wives of Henry VIII and The Empress Eugénie, and these were followed by such solo dramas as Mansion on the Hudson and her own adaptation of Margaret Ayer Barnes’s novel, Edna His Wife. In addition to appearing in her monologues and solo dramas, Miss Skinner has also starred in Theatre, Lady Windermere’s Fan, and The Searching Wind. 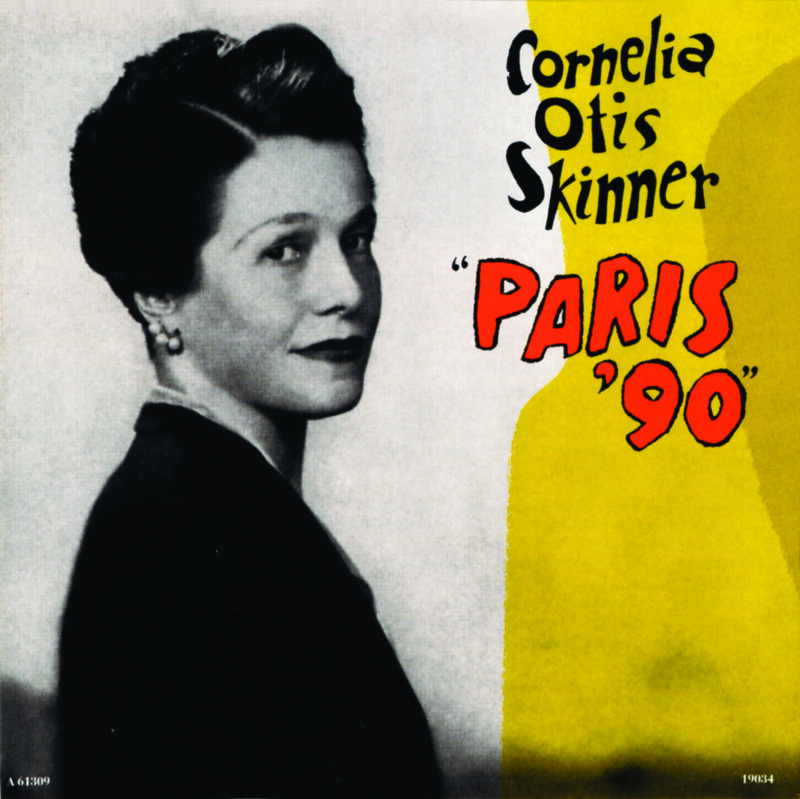 Cornelia Otis Skinner, performer Text by Cornelia Otis Skinner Music and Lyrics by Kay Swift Nathaniel Shilkret, Musical Director Orchestrations by Robert Russell Bennett.